Sheer desperation to capture the majestic, but elusive, wild cat through our lenses drove Alwan and myself to make a rather hurried trip to Ranthambhore. A long weekend at the end of March, provided the opportunity and with some quick online bookings for air/rail/safari tickets (logistic details at the end) we set off. The mood was optimistic yet tense. This was my first (and hopefully last) trip leaving Neelu behind, who could not join us for personal reasons. A flight to Delhi, followed by an overnight train took us to Sawai Madhopur at the wee hours (4 AM to be precise) that Thursday morning. An early check-in into Anurag Resort allowed us to freshen up and get ready for our first safari. Since we had booked rather late, it meant we could only manage three full day safaris. What we had not realized then was that full day safaris only go through a single zone – Zone 5. Thankfully, on two of three days during our stay, with not many tourists opting for the full day safari, the department offered to split it into separate safaris for morning and evening. As an incentive, they offered to let us pick our zone for the evening safari (on both ocassions), an offer which we gleefully accepted. 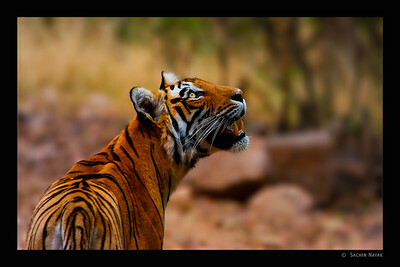 Thus began our tryst with beautiful Ranthambhore ! Day 1 Safari 1 – It was zone 5 to begin proceedings. A customary mobbing by rufous treepies at the gate and we were into the forest. The landscape was enthralling, nice rocky hillocks followed by dry grasslands. We were straining our eyes hoping to get a glimpse of any wild cats. We saw fresh pugmarks of a leopard but nothing besides that. A pair of peacocks put on a brilliant display, but as time went by our hopes of seeing a tiger/leopard faded. We were still optimistic and looked forward to our evening safari. We returned back to the hotel to get some much-wanted sleep having had a very early start and a very bad back due to the gypsy ride through the bumpy terrain. Day 1 Safari 2 – We chose Zone 3 for this safari. This is the rather famous zone with the lakes where Machli2 and her amazing cubs were photographed last season. With the cubs having grown now and one of the daughers (T18) now relocated to Sariska, the situation isn’t quite the same. Nevertheless we were really looking forward to this one. This zone is quite picturesque with the two lakes – Rajbagh and Padam Talao supporting amazing bird life. The light and settings here are divine – this indeed is nature’s studio at its very best. 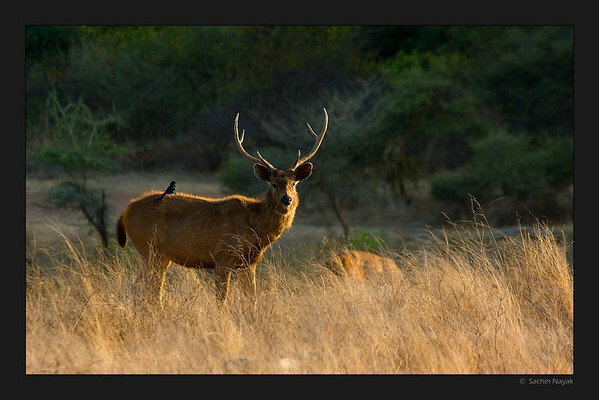 We got some shots of Sambhar deers here, but the big cats still shied away from us. Birds sighted included Eurasian Thicknee, Painted Snipe, Osprey, few sandpipers, redshanks, egrets amongst others. Day 1 over and disappoinment was slowly but surely settling down on us. Day 2 Safari 3/4 – Today we had a full day safari. Since two guests had not turned up, our trip was slightly more comfortable. It was another foray into Zone 5 and to fast forward a bit (by 2 hours), the sightings were very ordinary – exceptions being Grey Francolins with chicks and a pack of quails. We almost gave up any hopes, and were totally crestfallen, when the most unbelievable drama unfolded before us. A jeep preceding us sighted a leopard on a tree (unusually high for me). 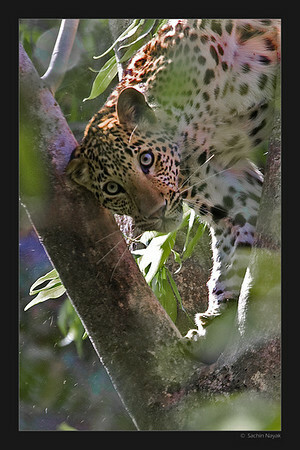 As we clicked hoping to get a decent shot, our driver sighted another leopard on an adjacent tree. This individual was a sub-adult and seemed very very scared. There was a semblance of tension in the air, as it hesitatingly started descending. The sub-adult leopard panicked and slipped from its perch. What followed was most unexpected. A tiger was waiting below (that explains the nervousness of the leopard). It pounced on the leopard and killed it in a matter of seconds. The pandemonium gave way to a eerie silence as we witnessed something few locals had ever seen before. The first jeep had to leave (since they were on a half day trip) while we stayed back. Our full day safari setup now turned into a blessing. We tried really hard to peep through the bushes and managed our first glimpse of the tiger (we could only hear it till now). It was feeding on the leopard it had just ambushed. We saw this with some disbelief. The guide told us that this could be a sign that the tiger is really hungry. Meanwhile, the first jeep informed a forest guard who came and drove the tiger away so that the leopard who was perched high up the tree, growling with fear, a mute spectator of the entire drama unravelling before itself, could scamper and run away from possible death. With no photographs but with extreme satisfaction at an unbelievable sighting, underlined by deep sorrow at the loss of the young leopard, we proceeded for our mid-day break. After an uneventful break, we started back on our afternoon safari hoping to see the tiger again. We however were told that the forest dept had scanned the entire area but could not sight the tiger. We had no expectations now and almost all of us in the gypsy were sleeping. We waited at the same spot for almost an hour with no luck. With unanimous opinion on returning, we were about to start, when our driver sighted the Tiger. T2 was back. It scanned the area for almost 45 mins giving us great views and some decent shots (it was cloudy and there were a few drops of rain). It searched all around for its kill (which was taken by the forest dept for a post mortem) and subsequently happened to find the first leopard (who had survived the ordeal earlier in the day). The leopard climbed up the tree to save its life. The tiger tried going around it, climb higher from the hill but to no avail. We again had to get a forest guard to help the leopard run away to safety. What a day it had been. On the way back we got a glimpse of another tiger sleeping just off the track but with no photography opportunity. We returned back with a HUGE smile on our faces. A quick shower and we headed to Ranthambhore Bagh where Aditya “Dicky” Singh had been very courteous to invite us for dinner. This gave us an opportunity to meet another renowned INWian Dhritiman Mukherjee amongst other guests. A great interaction with the stalwarts ended an incredibly fascinating and eventful day. 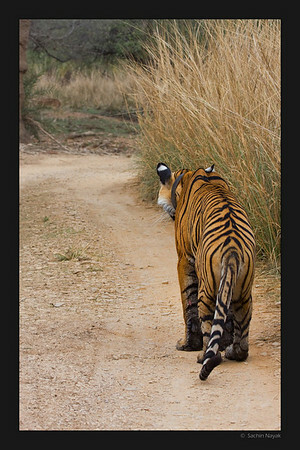 Day 3 Safari 5 – An early start and with luck on our side, we sighted a Tiger just past the entrance. It emerged out of the bushes and circled us with a degree of nonchalance. Light had not set in as yet to get good shutters speeds. As it started ambling on the track, a senseless piece of sheer stupidity cut short our experience. The tiger was walking carefree, when the driver of the other gypsy wanting to impress his foreign guests overtook the tiger to offer them opportunities to shoot it from the front. With a gypsy in front and a gyspy behind, the tiger left the track and disappeared into the scape. With around 10 gypsys and 3 canters full of vocal tourists waiting in anticipation, we left the scene. An hour into the safari, we came across fresh pugmarks in the Lakarda area and could also hear warning calls of Chitals and Sambhars. A tiger was surely around. We briefly sighted one in the distance but not for long. A couple of canters joined us and with some amazing co-ordination between the drivers/guides we got a short but very close sighting of a huge tiger as it crossed the track to disappear once again into the bushes. A quick break at a forest post allowed us to shoot images of Treepies on the ground. 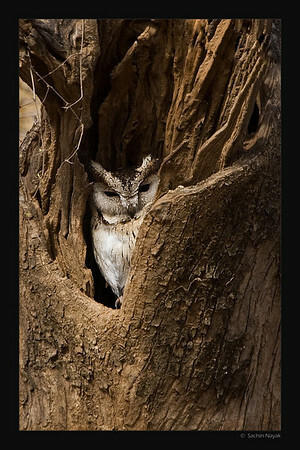 On our return we sighted a beautiful Scopps Owl, one of the few avian lifers on this trip. An early (and delicious) lunch and we began preparations for our final safari. Day 3 Safari 6 – We again chose Zone 3, having been mesmerized with the beauty this zone had to offer. Having seen 4 tigers so far, 3 of them rather close, we were no longer desperate to see another. But it would be a good way to sign off, more so if it would be along the lakes. 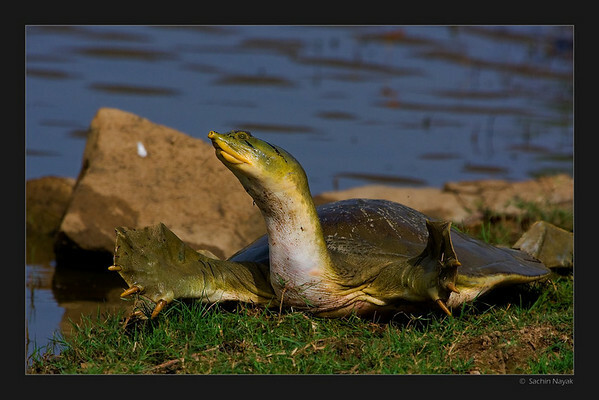 The safari started with an unusual sighting of a Turtle (possibly Indian Flapshell Turtle), which seemed shy initially but then nicely posed for all cameras opening into a hug seemingly welcoming all into his/her forest. 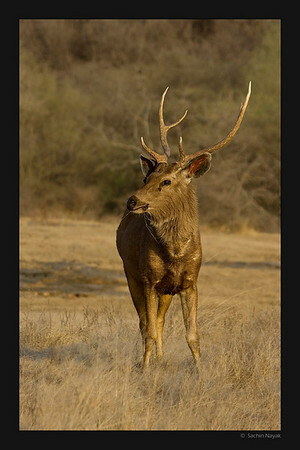 More sightings of sambhars, wild boars, nilgais and chitals followed but no tiger was to be seen. Everyone had given up any hope and were observing sambhar deers sparring for mating rights, when ….someone sighted Machli’s daughter (T17) on the other side of the lake. What ensued was an incredible melee, with 9 gypsys and 3 canters trying to outpace each other to the other end to get a good glimpse of the tigress. We waited for the dust to settle and hoped that she would cross over to the other side. When she did not, we too approached albeit keeping some distance from the crowd. And there she was, she emerged from the bushes, behind all gypsys right in front of us. She crossed our gypsy, paused momentarily, contemplating to go for a kill or not (I missed a golden opportunity to click her and a spotted deer fawn in a single frame, with my numb fingers failing to click). She decided against the hunt, as she ambled across and climbed on to the remains of this old fortress and settled down like a Queen in her Throne. She rolled over and then gave a regal look as innumerable clicks could be heard attempting to capture her glory. 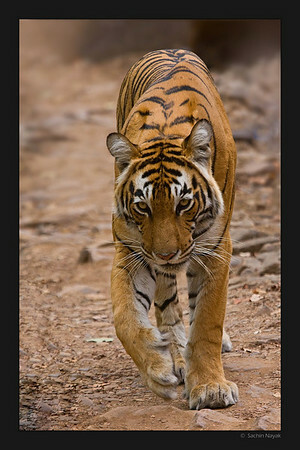 This drew curtains on our incredible tryst with wild cats in Ranthambhore. Fantastic experience, some memorable frames and lot of satisfaction….as we headed back. For more images from this trip click here or the Photo Gallery link (sidebar). Indian Airlines/Jet Airways fly BLR-DEL with an afternoon flight around 4 PM. This suited us best. New Delhi Airport to Hazrat Nizammuddin Rly Stn took us around an hour. Intercity Express to Indore stops at Sawai Madhopur (scheduled arrival at 3:15 AM). If short on time, this is ideal. We stayed at Anurag resort. Basic accomodation at reasonable rates. Located right opposite the Safari Booking point, so very convenient. We would always be the first to board the gypsy. 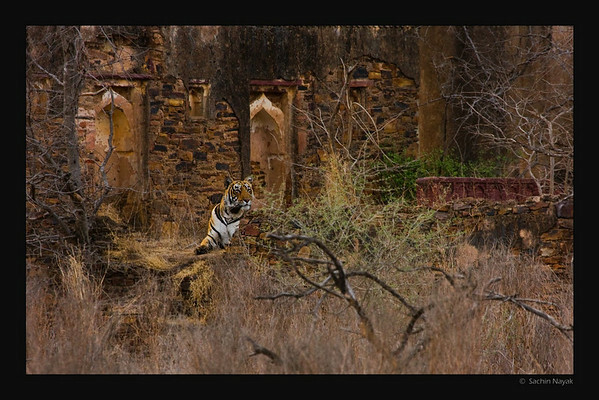 We would have loved to stay at Ranthambhore Bagh. Probably the best place to stay for photographers. Has amazing online reviews. Do not miss any opportunity to try out the amazing tea at Manisha Tea Stall, just besides the safari booking point. It is simply out of this world. Try their fulka-subzi too. Awesome taste and VFM. You can pamper yourself here after a tiring safari and not feel any pinch on your wallet. Flying the good times !! !